The natural heir to Robert Jordan, Brandon Sanderson's Stormlight Archive series hit No.1 in the US and No.2 in the UK with the hardback release of the massive second volume, WORDS OF RADIANCE. Split into two volumes for paperback this is Part One of that second volume. 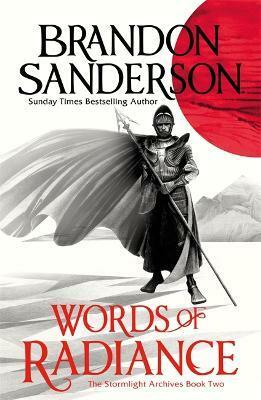 WORDS OF RADIANCE takes the reader even deeper into the lives of its characters as they fight for power, freedom and their lives on the extraordinary, hurricane swept world of Rosharr. Famed for his plotting, his wonderful characters and his intricate magic systems Brandon Sanderson is poised to take up the crown of Robert Jordan as the creator of the keynote epic fantasy series of its time with the Stormlight Archive. Brandon Sanderson was born in Nebraska in 1975. Since then he has written, amongst others The Mistborn books and begun the internationally bestselling Stormlight Archive. He was also chosen by Robert Jordan's family to complete Jordan's Wheel of Time sequence. He lives in Utah. Visit his website at http://www.brandonsanderson.com, follow him on Twitter at https://twitter.com/BrandSanderson and like him on Facebook at https://www.facebook.com/BrandSanderson. Read his blogs at http://mistborn.blogspot.co.uk andhttp://mistborn.livejournal.com.